To kick-off Memorial Day weekend celebrations, Red Rocks is welcoming The Devil Makes Three. They are a California-based act that celebrates everything Americana in music: ragtime, jazz, old time, bluegrass, country, blues, and folk. The three-piece band fuses diverse sounds with electric and acoustic instruments. A such, the combination provides an organic-feeling concert experience where one can chill or dance. The team at Lucy Sky recommends our indica-dominant hybrid Holy Grail as the strain of choice for this show. Because, this hybrid will mellow you out without “couch-lock” effects. This ideal blend of chillness and attentiveness is a perfect mixture for a diverse act like The Devil Makes Three. There is no better way to vibe with East Coast electronica funk grooves of The Disco Biscuits than with some East Coast Sour Diesel. After a three-night run at the Ogden Theater, The Disco Biscuits will be at the Rocks on Saturday May 27th to throw down some psychedelia under the night skies. Sour Diesel is easily the East Coast’s favorite strain. That being said, the strain’s energetic high exemplifies the edgy, fast-paced lifestyle of our neighbors on the other side of the Mississippi. Therefore, this sativa “fuel” is a must have for Philly’s very own Disco Biscuits. It is sure to get you out of your seat for this ground-breaking act that blurs the lines between jam and electronic. Ween has established a huge cult following over the years. This is due largely to their rampant originality and downright weirdness – making them next to impossible to label with a genre. Therefore, a hybrid cannabis that defies reason is the perfect fit for this famous act. The Ween circus is coming to town on Tuesday June 5th and Wednesday June 6th for a two-night stand at Red Rocks. For these amazing shows, Lucy Sky recommends joining their eccentric ranks by imbibing with our Blueberry Headband. This hybrid strain offers up a venerable psychotropic smorgasbord of body and mind sensations. This combination can only be achieved with a balanced blend of indica and sativa. As such, Blueberry Headband will go the distance for two nights as Ween delves in and out of rock, folk, country, blues, jazz, punk, and metal jams. Sativa strains are essential for the dance floor. That being said, Lucy Sky’s Read Headed Stranger will tighten up your moves with energy and clarity at Chromeo and The Glitch Mob on the Rocks early this summer. For starters, Chromeo has become a favorite of millennials and beyond. The Canadian electro-funk duo puts on a dance party that appeals to anyone interested in losing inhibitions and getting weird. For their part, The Glitch Mob brings some of the most innovative sounds in EDM (electronic dance music), that sample rich beats from hip hop and more. Our powerful sativa Red Headed Stranger will not only help you climb the steps at Red Rocks, it’s the ideal strain for crushing the dance floor at these throw down shows. 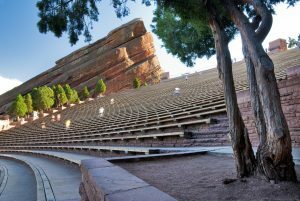 The Avett Brothers are bringing a more mellow concert experience to Red Rocks for the last weekend in June. Our crew at Lucy Sky strongly recommends the indica strain Ghost of Leeroy for this show. With this mellow variety, you can relax and take in the night sky and the lights of the city. The Avett Brothers compose acoustic melodies that highlight their musicianship through various genres including folk, bluegrass, country, and pop. As such, Ghost of Leeroy is an excellent paring of cannabis strains for Red Rocks concerts where you will want to have a seat on a blanket and pay attention to the acoustic orchestrations on stage. If you have any questions about Lucy Sky and the pairing of cannabis strains for Red Rocks concerts and beyond, please reach out! !